A doorway page is a web page designed with one purpose, that is to get a high ranking in the Search Engines for a specific sets keyword or keyword phrases. It is a powerful, content rich page packed with keywords. 2. Click “Page” icon on the main tool bar or go to “Tools/Page Generator” from the pull down menu to pop up the Page Creator window. 3. Name - Click “New” button to specify a new file name of your doorway page. 4. 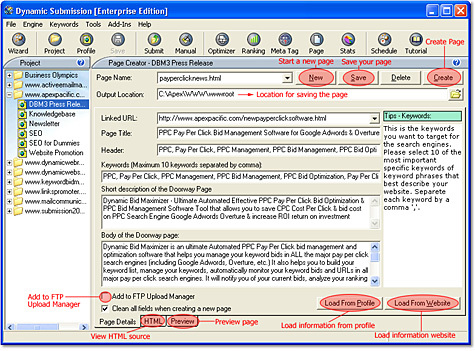 Output Location - Click the “Open Folder ” icon next to the Output Location text box to browse for a location where you wish to save your doorway pages. 5. You can choose to manually type in your doorway page details, or load it from a profile, or from a Web site.